This article is good, but may I ask what your sources of information are? A lengthy reading list spanning over many years and personal experience, for the most part. Like Paul Coussement so eloquently states, “the intestinal acceptability of a food can be judged only by the person who eats it” (Coussement, Paul AA (1999). “Inulin and oligofructose: safe intakes and legal status” published in The Journal of Nutrition- one of many sources). 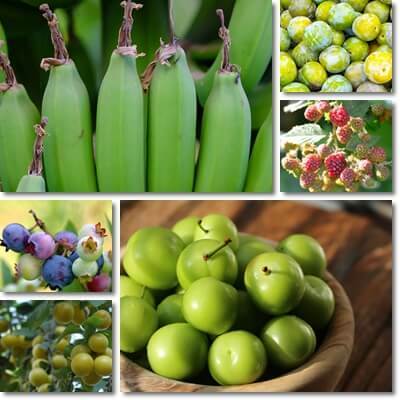 And I must say I’ve eaten all kinds of unripe fruits in different amounts, from unripe, green mulberries and myrobalan plums or cherry plums, cherries, apricots to unripe tomatoes, bananas or avocado. When you eat unripe green fruit, you essentially get a different nutrition than from the ripe fruit. And that different nutrition mostly consists of more of a less digestible fiber material (and various vitamin, mineral and antioxidant differences). Depending on a person’s individual response to fiber and reaction to various intakes, different effects may be observed, from passing flatulence and soft stools (which are not necessarily side effects) to abdominal cramps, bloating, diarrhea and stomach upset that may trigger existing gastrointestinal conditions. To better understand where my knowledge of unripe fruits and their adverse reactions comes from, please look up information on the side effects of dietary fiber, the effects of dietary fiber on conditions such as gastritis or IBS and nutritional profile and chemistry of various unripe fruits vs their ripe counterparts. It should provide a fairly broad view on the subject. Wishing you lots of health!